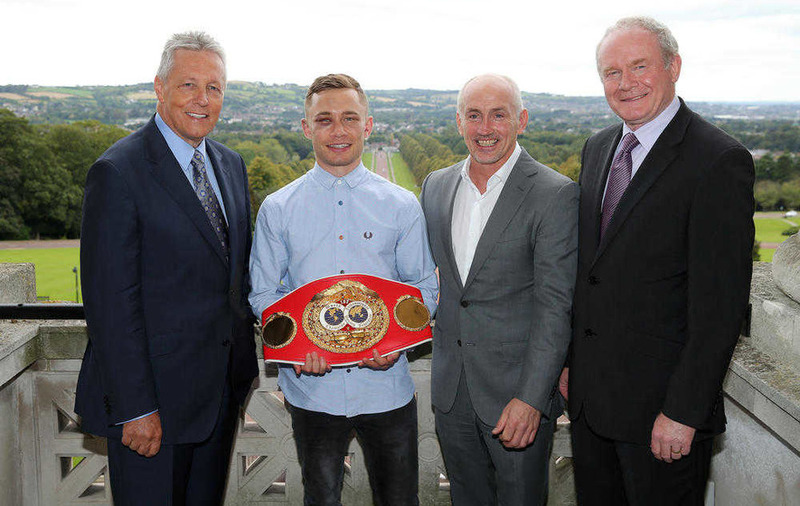 June 4 2014: Press announcement that boxer Carl Frampton will fight for the IBF super-bantamweight world title against Kiko Martinez in Belfast on September 6. June 25: Senior executive officials meet Cyclone Promotions representatives at the Europa Hotel in Belfast to discuss a request for public funding for the event. June 26: David Sterling, then permanent secretary for the Department of Enterprise, emails Cyclone to confirm funding will be provided. "With such short notice you will appreciate that your request for financial assistance does pose challenges for us," he says. "In order to access these funding streams you will need to work with each organisation to develop a proposal that delivers benefits against their objectives." Mr Sterling requests that in a press announcement Cyclone thanks First Minister Peter Robinson and Deputy First Minister Martin McGuinness "for the assistance the Northern Ireland Executive is giving you (without quoting any figures at this stage)." June 30: A letter confirms the fdfm have agreed to support a funding bid worth £250,000. The title fight eventually received £300,000. The Department of Enterprise gave £150,000, the Department of Culture, Arts and Leisure gave £100,000 and Belfast City Council £50,000. July 6: Tickets for the fight go on sale with some brackets selling out in just three minutes. 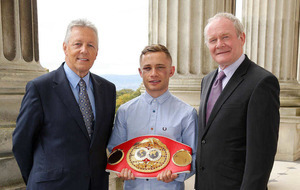 September 4: The Irish News reveals the Frampton fight is being backed by hundreds of thousands of pounds of public money. 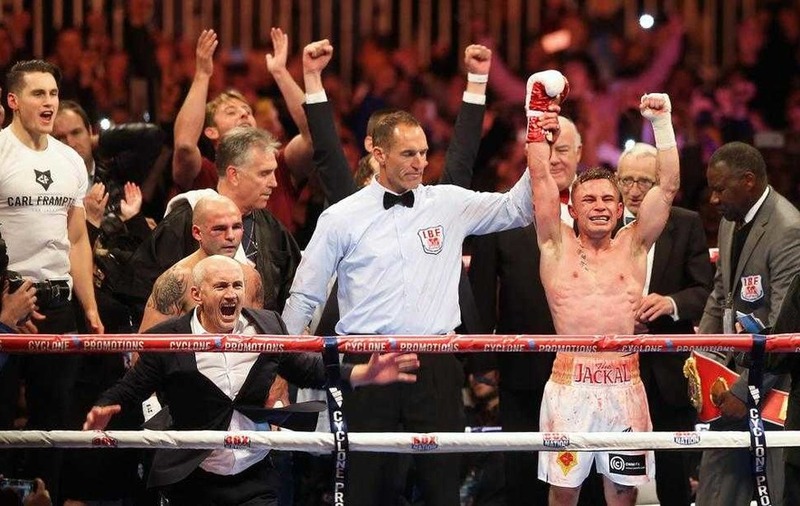 September 6: Carl Frampton beats Kiko Martínez to become super-bantamweight world champion in front of 16,000 fans at a purpose-built arena on Titanic Slipways. 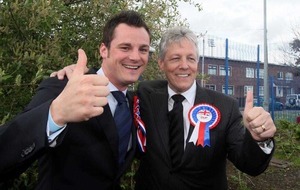 September 11: The Irish News reveals Peter Robinson's son Gareth was part of the team behind the title fight that received £300,000 of public money. October 6: It emerges that justice minister David Ford expressed his "surprise" at learning through the media that Mr Robinson's son was involved in the event. In a letter to fellow executive ministers, the Alliance leader said it appeared to him that the first minister should have declared an interest. It came after Mr Robinson had asked Mr Ford about the PSNI's policy on charging for policing events such as the Frampton fight. The then DUP leader rejected suggestions that he should have declared an interest, and insisted he was not lobbied for funding by his son. November 17: The Irish News reveals the PSNI slashed its bill for policing the Carl Frampton fight. A chief inspector met with a Cyclone representative just days before the bout and agreed to charging Cyclone £5,000 for policing. The overall policing cost was £35,585 – meaning the public had to pay more than 85 per cent. The fight was also the only event in recent years to secure a discount on policing charges. November 22: The Irish News reveals Cyclone applied to the Department of Culture, Arts and Leisure (Dcal) for £100,000 of funding just five days before the fight. The business case included an agreement to organise community events such as a programme encouraging healthy lifestyles among schoolchildren. Cyclone sent their finalised business case to officials on September 1. Just three days later Dcal sent Cyclone a formal letter confirming that its funding application had been accepted. August 6: Policing Board member Dolores Kelly criticises the PSNI's decision to waive most of its bill for the Frampton fight, saying that "any such event in the future must be dealt with more appropriately". December 17 2015: Ofmdfm discloses Frampton fight correspondence in response to a Freedom of Information (FOI) request – more than 14 months after the FOI was sent.